Shopsmith is the Swiss Army Knife of woodworking. They do almost everything you might need for a woodworking project and a friend of mine has wanted one since the 80’s. Recently he got tired of waiting for the cash to get a new one and began searching for a used Mark V. Ebay wasn’t really a help for completed units, but Craigslist listed about 10 of them in the area in various conditions and states of inactivity — so we started shopping. One that was freshly hauled out of a local garage showed up in the listings, sporting a price tag of $200. With a heavy dose of skepticism we went to check it out. It was quite obvious this machine had seen better days. There was minor rust on the legs and casing and heavy gunk on the tubes — plus the right base was cracked from someone leaving it in drill-press mode for what looks like decades. All of it needed a good going over. Those were the negatives. But the motor sounded great and there was a giant box with all the pieces, connectors, hardware, belt sander, and scroll saw in it. A little stack of cash and a few ratchet straps later, the Shopsmith was back at my friend’s garage. When we set it down in the driveway we realized how much work was ahead of us. Cleaning, for one; a new base; and some paint were in store. For those not familiar with the company, Shopsmith is extremely proud of their new off-the-shelf replacement parts. Bargain-hunting on the net, we found a new base for about $40 in the door (list is over $100), and began looking for attachments like band saws and jointers which retail for around $500 to $600. We found them for about $150 a pop delivered. Once all the repair work, cleaning, calibration, and pieces arrive, we’ll post an update, but the entire thing will wind up costing a fraction of what it would have new. Detractors would simply say to buy separate units and be done with it, but once complete, the Mark V will have 11 solid woodworking modes/tools designed to work with each other for about $600. Awesome to hear you have joined the ‘family’. I really enjoyed restoring and regularly using my older Model 10 ER. Sure it’s slow and takes time to change and set up, but I don’t mind as it saves space in the cramped garage space that way. It is a true work-horse, and built in the US when things built here were made with pride and meant to last. I’ve had a Mark VII since the 70’s. It’s wonderful to have a machine like this, on wheels, in a small shop. I use the bandsaw the most, sometimes use the strip sander. I always keep a wire brush chucked in for cleaning stuff. Just curious what kind of things do you use the band saw for? I just bought a used mark v.
I sold Shopsmiths in Dallas for several years and owned a couple of them. They are a great well built machine that if taken care of will last for generations. Some things to check, and precautions. First check the bearings in the upper shaft of the headstock. These can loosen over time and may need to be replaced. The next is the speed control. It is a bit of a weak link and the most replaced part on the machine. It breaks when a person tries to change the speed without it being turned on. Last, make sure to oil the sheaves on the motor. There are two spots one of which is under the spring. It’s a little tricky, but will make the speed changes much easier. I just sold my Dad’s old unit to a friend, and I think there may have been an owners manual. If you want, e-mail me and I’ll see if I can get you a copy. Hi Glen ,looks like 7 months since you posted that you were looking to sell an old shopsmith. Do you still have it & where are you located if so. I just picked up a Mark V at auction. I have always wanted one. I am in need of a manual, though, if you still are able to send it. Thanks! we needed a more reliable saw at the farm and found a shopsmith at a nearby town. it came with a bandsaw add-on. the smaller table can be annoying and tilting the table instead of the blade on large stock requires assistance. on the upside this tool was cheaper than the sliding mitersaw i was considering. the bandsaw is quite good. the cuts on the table saw are accurate. the disc snader is great since it actually is square to the table. gary z’s warning about the speed control is dead on and if you use this tool heed his warning. you’ll get a lot of use out of this tool. “Once all the repair work, cleaning, calibration, and pieces arrive, we’ll post an update” – coincidentally i inherited a shopsmith in fairly good shape except it has some rust on the steel tubes as in the photo above – what is the best why to clean this? – tips? I have had great luck removing rust from the tubes, legs etc. Through electrolysis: nailed some scrap 1x4s into a frame with short legs, draped a tarp over it and filled it with a hose. Add washing soda, a piece of bare non stainless steel, and an old battery charger. Rust comes off line magic, leaving all the viable metal untouched. Cheap, no heavy work, extremely effective, totally nontoxic… As long as you do not use stainless as the sacrificial anode (you’ll see conflicting information regarding that risk, and it just isn’t necessary so don’t chance it). You’ll find lots of details online, I know the original writer of the question won’t use this but others might and I found out in a similar stale threat comment. A Shop-smith is a good beginners tool with a lot of bang for the buck. My grandfather had one and its what I grew up around. I have never actually used one but I have been a bit leary about the safety of such a small table for the saw. That being said all the accessories and overall footprint make it a good choice for a lot of people. I’ve read several posts on the Shopsmith forums where they basically take a drill and attach it to one end of the tube and then attach the other end to a free-spinning bearing of a sort.. Then you just turn the drill on and use either steel wool or fine sand paper to remove the pitting,etc.. Then make sure you put some Johnsons paste wax on it to keep the rust at bay.. Checkout those forums — lots of invaluable info..
Used one once and found it lacking, at least from the table saw perspective. I guess if you don’t have much space, and accuracy and convenience is not a concern, this might be a good option. I have a 10E (that’s E for ‘experimental’, without the R for ‘Revised’; the revision being all the safety modifications introduced after the original manufacturer was sued for customer injuries.) It was a complete basket case when I got it (for free, after failing to sell in the estate sale of my friend’s grandfather.) It must be used with caution, but is a versatile platform for a variety of functions. I’ve even added my own attachments (home made ball mill) to reap the most from my investment of $0 and a few hours of elbow grease. Where are you finding all the inexpensive parts for your Shop Smith? Any web sites? Catalogs? I broke the lathe carriage today trying to true up an out of balance log (working toward a walnut bowl). I can’t find a locking mechanism for the head (motor unit). It says this is a model Model ER (no 10 indicated) How do you move this? Is there a lock nut or hidden set screw? Any help appreciated. Richard, I may have the parts you need. Contact me, please. eBay, Craigslist, Shopsmith user forums online, and local estate sales are a great source for Shopsmith parts, if you have more time than money. If you have more money than time, I believe Shopsmith still sells parts and supplies for most everything they ever made. The tablesaw function gets a bad rap, but I find it works quite well for its domain of small-to-medium projects. Granted, mine started out at the 510 with the larger tables and extensions, and I later upgraded to the 520 fence system. The tilting/lifting table is a necessary design compromise, but I find bevel cuts to be rare for most projects, while miters are a bit more common. I built a slick 45-90 miter sled for compound crown molding cuts, say for around tops of bookcases. Shopsmith Forums have a video of how to use the 510/520 floating tables, tubes and leg set to extend the in and out feed tables on the table saw setup. Very good use of the floating tables and makes a imitation of a very large panel saw setup….but. For most large projects, I just cut the 4×8 to smaller sizes and then use my SS for trim work. By buying and selling over the past 6 months, I went from a basic 510 to now a digital 520 setup with everything but the large planer. I have a Delta for that use. I still buy and sell SS’s as a hobby. On the rust question, I use Coca Cola and 0000 steel wool. Vinegar also works as a mild acid. I guess Cokes will eat your stomach too! SCORE! I now have the Shopsmith Planer. Final cost…zero…when I sell off the other tools. So far, I am $50 AHEAD on the deal so the planer cost me a net of -$50! I love buying and selling Shopsmiths! I have a Mark IV that I am trying to get rid of. Motor does not work but includes band saw,belt sander,jointer,dado blades,disk sander,and other accessories. Please give me details of what you have,,,IF you still DO.I have had 4 in the past 26 years and want one now. No way a motor cost that much. Motors you can buy, the problem is that shaft. Any ideas were you buy one new or used ???? I recommend purchasing a small portable Delta 10″ table saw, about $99 dollars and either a Delta, Skill or Rousseau folding stand. The saw slips right in. W/ optional out feed table,you can tackle anything.It comes with an impressive rip fence and it all folds away to nothing and frees up the Smith. One other option is to put a piece of plywood over the saw table. You’ll need to be creative in anchoring it and the building of a fence. For years, I had one at the ready. In case anyone stumbles on this as I did (long after the fact but with the same questions), it seems the folks who know best recommend avoiding abrasives as much as possible when removing rust from the tubes (and other parts) by first using a very simple homemade electrolysis setup. I’ve got to try it on my s.s. and some other old rusty things. Google for details or check out the stickies on the shopsmith forums, you’ll see some great results. I just found a Shopsmith 10E oh criegslist for free. It ran and came with 2 large boxs of accessories. A jointer and a jig saw. The rust on the tubes was very bad. I just spent the weekend de-rusting. I had no choice but to sand with a 40 grit just to be able to get the tubes out of the unit. I used a rotary sander (shutter) progressively working my way up to a 220 grit and then some emery cloth. Sealed it with a coat of mothers metal polish and buffed it to a shine. Then I took an old oil rag and polished it with that. It has worked out fine but was a lot of work. I think in the end it was my only real option as there was some serious pitting action going on. I have had both an er10 and have upgraded to a Markv. Oarted out the er10. still have a few parts left.Find the shopsmith to be an excellent tool. Set up fordifferent operations simple take a few minutes. FWIW: I owned a shopsmith for a couple decades (’55-’75). . . used it constantly for every damn thing. Built a redwood strip canoe, cutting 17′ planks into 1/4″ strips effortlessly, made dozens of decorative, fancy fingerlap jointed 8 compartment wall boxes (for dried flowers, seeds & such)for sale at craft shows and my ladies Country Girl Melon Farm roadside stand (sold all I had time to make,) handled all of the zillion rural/farm woodworking challenges with finesse plus many custom one-of-a-kind thingees that would have been all but impossible without the ‘Smith – not to mention requiring a few stand-alones that would seldom be used ever. Admittedly, a dedicated table saw would be more efficient and easier to set up, and I had a radial arm saw. But to out ‘Swiss Army Knife’ the Shopsmith, realizing that the variable speed capability was all but unique then and applied to all of the official and ad lib accessories, would require a LOT off space and a LOT more munny. I am looking for one again, hopefully used but new maybe as I am back in an environment where it would be a real friend. It ain’t the violin that makes the difference. It’s the violinist . . . as in the old time poem, the Master’s Touch. Not sure where you are located but I have a Shopsmith MarkV model 510 in excellent condition (hardly used) that I would like to sell. I am in the New England area. If you would like pics, I can send them to your email address. Price is $750 for local pick up. Comes with operators/owner’s manual, Work table, Extension Tables, Rip Fence, Miter Gauge, Mark V accessory shelf, sanding disk, and adaptors, saw blade with arbor, and assorted other items. Hi Dave I am south of Boston and may be interested in your Shopsmith. Do they all include a lathe & drill press? Larry? I know that ths post over two years old, but did you ever get a ShopSmith? I have a Shopsmith that I am considering selling. I will have to round up all the accessories. I also have the original manual and a stand alone Shopsmith band saw. We bought it in the very early 90’s. My husband loved the lathe. He is a machinist. I don’t have a price yet, but I am getting there. As soon as I have gathered all the accessories, I will have a better idea. lathe for sale listed on craig’s list gulfport, Ms.
Did you sell the Shopsmith? I live in TX and looking for a used one. 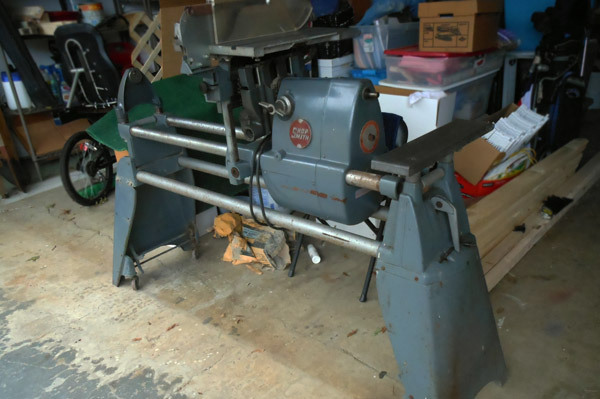 I have a markVII for sale with sander,band saw sander and all lathe tools for sale, is a9 out of 10 condition, would like to sell it all as a packageI know it still runs but have not used it in 20 years would like an offer over 500.00. Its in Las Vegas, shipping or Preferabley pick-up have new belts and parts from Shopmate I bought when I wennt to there shop back east. In the Central Texas area. I have well used Mark V needs lots of TLC for sale. Broken main shaft, rusted tubes,etc. Could be restored if you like to tinker and have the time, or part out. All of original pieces plus more aquired over the years. My son used as lathe on patio and failed to protect from weather. Been using as belt sander powered from other end of headstock. I’m in Dallas, OR. How’s $200. pick up only, can’t ship. Looking to sell my Fathers Shopsmith Mark 7, Table saw, Scroll saw, Lathe, Drill Press, dust collection ports, etc. Family owned since late 60’s. Great Condition.